In my professional opinion the market for silver has evolved in two distinct ways over the past ten years. 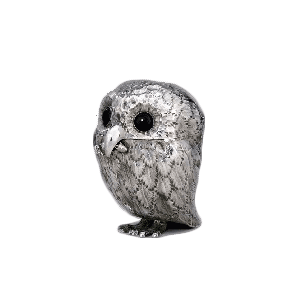 Firstly, buyers want the items that they purchase to advertise their investment, and as such there has been a rise in demand for grandiose 19th century silver rather than the more academic and refined silver from previous centuries. Secondly there has been a distinct move away from the taxonomic approach to collecting. By this I mean there are fewer buyers that focus on one object, say coffee pots, and seek to buy an example of each known type. Buyers now seem happy to collect across many subjects, even disciplines, buying solely what brings them pleasure. 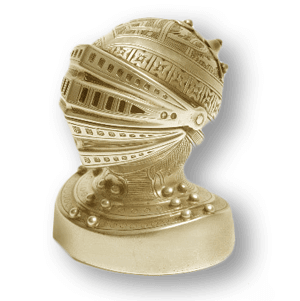 One subject area that is benefitting from both of these trends is novelty silver cruets (or condiment sets), where the detailing is often exquisite and where there are various types and combinations of object that appeal to the collector. What is a silver cruet? You may see salt, pepper and mustard sets advertised both as cruet sets and condiment sets. Technically a cruet is a small vessel with a narrow neck and a cover which is used to hold the condiment. A condiment is a spice, sugar, oil or sauce used to enhance the flavour of food. As such I will refer to such items as cruet sets rather than condiment sets. 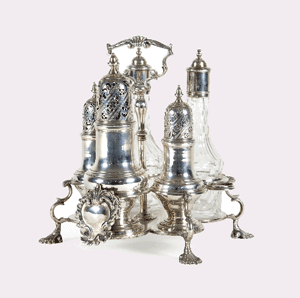 It was long thought that the earliest known cruet set was made for the Earl of Warwick in 1715 by Anthony Nelme. Although subsequent sets have come to light from around 1707 it is the set made for the Earl of Warwick that has remained the most famous. It consisted of five casters mounted on a frame and was so popular that the term ‘Warwick Cruet’ continues to be used for the name of this type of set. As the usage of condiments changed from the early 18th century through to the end of 20th century the number of casters, and its usage, have changed. The original Warwick Cruet had two bottles for oil and vinegar, a blind caster for dry mustard (which was originally mixed on the plate), and two pierced casters. This configuration continued through the 18th century and indeed into the 19th century. However, the principal form from the 19th century often comprises just a salt, pepper and a pot for wet mustard. The break with function over form really starts at the turn of the 19th century but does not gather momentum until the middle of the century. The wet mustard pot (as opposed to the dry mustard caster) dates its form back to early part of the 18th century and from this point on was continually subject to piercing, engraving and repoussé work although the barrel or drum form was essentially the same. The mustard pot illustrated here is by John Bridge and was assayed in 1826 and retailed by Rundell Bridge and Rundell. It is worth over £10,000. The function of the mustard pot is by no means lost but here the form is more importantthant the function. Another well-known form of mustard pot is the owl illustrated here. It was made by Charles & George Fox in 1848. 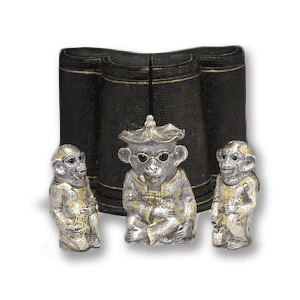 They became well known for their silver novelties and the owl form has been copied many times by the likes of George Richards & Edward Brown who releases a series of pepperettes in the 1870s and through the 20th century by Sampson Mordan & Co.
One of the rarest types mustard pots are those in the form of Classical Chinese Temple Dragon. These are arguable the rarest and most desirable in the current market so it is well worth keeping an eye open for them. A superb example of a novelty silver cruet set. As Naturalism gathered momentum from the mid-1820s it was not long until silversmiths took to designing not only the mustard pot but also the salt, pepper and stand that the mustard pot is commonly associated with. It is much more common to find a novelty three piece cruet set, comprising of a mustard, salt and pepper, without the stand that was designed for it. A common set is a group of three frogs. This set of three frogs is quite a common design, often by Richard or William Comyns and often produced around the 1970’s. Identical sets have been offered on the market over five times in the last 10 years at the like of Bonhams, Wooley and Wallis and Tennants. They have sold from £250 (in 2006), £960 (in 2010) and £5,200 (in 2015). This would seem to indicate an ever increasing demand, but auctions are fickle creature and another set was sold just weeks after the figure of £5,200 was achieved which only realised £1,800. I would agree that the general trend has been greatly upward, but auction fever can lead to a price paid not reflecting the true worth of an item. For a long time now the figural salts by the Barnards have been making incredible prices. 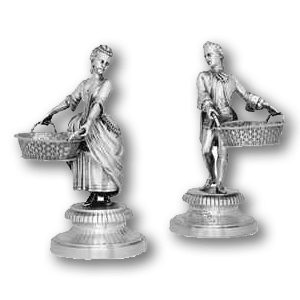 Originally designed by French sculptor Louis-Victor Fréret (1801-1879) for Barnard’s in the 1860s, these salts depicted pairs of figures of the aristocracy, so called ‘High Life’, and peasants, so called ‘Low Life’. They continued to be made into the 1970s. Demand has often been insatiable, with the set here selling for almost £9,000 in early 2014.
Pepper pots or pepperettes date back to the second quarter of the 18th century and were originally made for cayenne pepper and black pepper. The fact that they can be bought as singles, being much cheaper than a pair, yet keep the charm and design of their more valuable sets mean that they are often the most affordable way into the market. A pair of figural salts by the Barnards. A novelty pepperette made in the form of a knights helmet. As mentioned throughout this article the market for novel silver is currently experiencing a boom. What was once overlooked for being frivolous or shallow is now at the top of many collectors’ and dealers’ wish lists. Should you be investing in novelty cruets? I am always cautious of buying antiques as investments as the relationship between fashion and value are so closely linked (ask a dealer if 20 years ago they imagined George III coffee pots would ever sell for less than £500! ), and given that the price of novelty cruets are currently at a high, it would not be the logical time to buy. However, when did we ever let logic rule our hearts? We buy and collect antiques not because it is the logical thing to do, we do it because we love their form, their history and their charm. If you have the money, and owning the object would bring you happiness, then spend your money; you can’t take it with you after all! If you would like a free, no obligation valuation of your silver cruet, mustard or pepperette then please use the form below.